Vitamin K-2 shares many of the same vital roles as vitamin K-1. They both stop bleeding by making your blood clot, and both contribute to bone and cardiovascular health. Early studies suggest that vitamin K-2 may do a better job of fending off coronary heart disease than vitamin K-1, although its role still needs to be defined through more studies. Very few serious side effects are associated with vitamin K-2. The biggest concern is its potential to interfere with blood-thinning medications. Vitamin K-2 is the generic name for a group of substances known as menaquinones, or MKs. Each one in the group is identified by a number, such as MK4 or MK7. 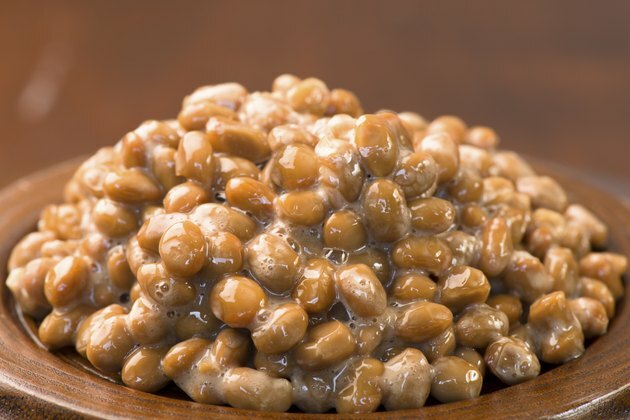 All of them except one -- MK4 -- are naturally produced by bacteria in your large intestine and in fermented foods, such as cheese, yogurt and a fermented soybean product called natto. You'll also get a small amount from meat, especially liver. MK4 is synthesized when vitamin K-1 is converted into vitamin K-2, according to a report in the "British Journal of Nutrition" in October 2013. Blood-thinning medications such as warfarin work by inhibiting vitamin K. Because of their close relationship, the most significant side effect from vitamin K-2 is its ability to interfere with these medications. Suddenly increasing your vitamin K-2 from any source, whether foods or supplements, may decrease the effect of warfarin. Cutting down on vitamin K-2 may boost its impact, reports the National Institutes of Health Clinical Center. This side effect may be more significant with vitamin K-2 than vitamin K-1. Even small changes in menaquinone consumption may disrupt anti-coagulant medications. While an allergic reaction is possible, vitamin K-2 supplements are generally safe and nontoxic, according to the Linus Pauling Institute. Menaquinones may be metabolized differently than vitamin K-1. For example, the effect of vitamin K-2 from fermented foods on warfarin may last longer than vitamin K-1, reports the American Cancer Society. It's important to remember that more research is needed to fill in the gaps in current knowledge about menaquinones and how they differ from vitamin K-1, according to the October 2013 report in the "British Journal of Nutrition." In the future, separate intake recommendations for vitamin K-2 may be developed, but for now only one guideline exists. The recommended daily intake for total vitamin K from all sources is 90 micrograms daily for women and 120 micrograms daily for men. If you take antibiotics or medications to treat an irregular heartbeat, be aware that they can interfere with the production of vitamin K-2 in your large intestine, reports the Linus Pauling Institute. You may have trouble absorbing vitamin K-2 if you take cholesterol-lowering medications or fat substitutes such as olestra. Consult your health care provider if you have any questions about your need for vitamin K-2.